It is time for the TCPTUES346 challenge and it is all about die cutting! There is so much you can do with this challenge that everyone can join in on the fun. 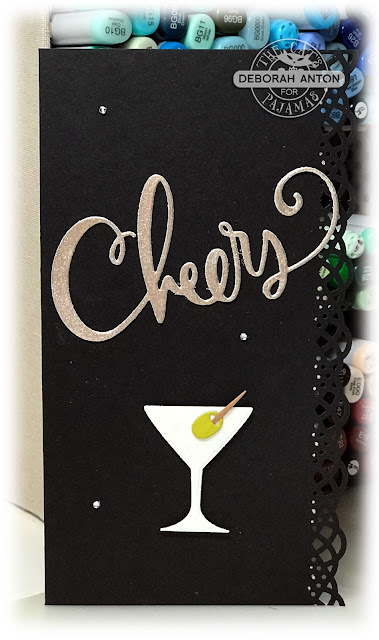 For my card, I am using the new word Cut Up of Cheers along with the coordinating Cut Ups that go with the 'tini stamp set. I cut out the word with some card stock I added embossing powder to for added sparkle. The 'tini glass was cut out with some white glitter card stock and the card was finished with some rhinestones and the edge of the card cut out using an edge punch. A simple but sparkly card! We sure hope you come play along with us and link your creation to the TCP Blog for a chance to win! Be sure to stop by the TCP Blog to see all the Kitty Cat packs' creations. Thanks for stopping by!